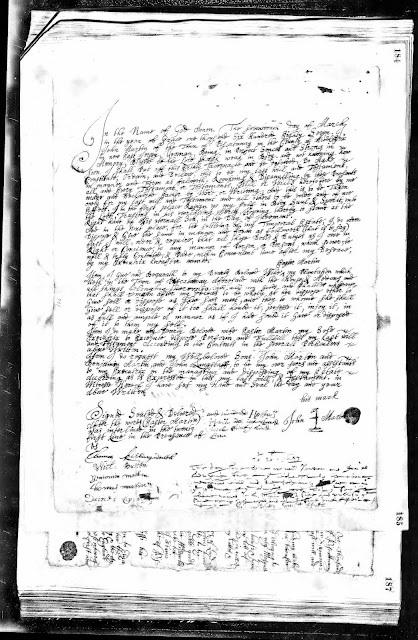 Genea-Musings: Amanuensis Monday - Post #294: 1687 Will of John Martin (1620-1687) of Piscataway, N.J.
Amanuensis Monday - Post #294: 1687 Will of John Martin (1620-1687) of Piscataway, N.J. The subject today is the 1687 will of John Martin (1620-1687) of Piscataway, New Jersey. Right hand of His eternall Son, in the Bay of Judement. by m,y Executrix hereafter named. of it to them my self. New Jersey, Wills and Probate Records, 1656-1999, indexed database with digital images, Ancestry.com (http://www.ancestry.com :, accessed 7 September 2015, no longer available), Middlesex County, unknown volume, page 185 (image 115), John Martin will, 1687; citing original data from New Jersey County, District and Probate Courts. In this will, John Martin names his wife "Easter" as his executrix, and sons John and Benjamin Martin, Hopeful Hull and John Langstaff, as overseers. He does not name all of his children. Hopewell Hull was the husband of his daughter, Mary Martin (1649-1694). John Langstaff was the husband of his daughter, Martha Martin (1653-1694). There is the list of children and grandchildren! I am descended from their son, Benjamin Martin (1659-1732) and their daughter, Lydia (Martin) Smalley (1655-1731), who married John Smalley.